Hemp Nation Vanilla Pineapple tan extending moisturizer hydrates, nourishes and revitalizes skin. How long does your tan stay golden? If you’re finding that your color is fading in less than a week or that your skin is peeling or flaking soon after your session, you’re experiencing poor results from tanning likely due to the moisture content of your skin. When the skin tissue becomes dry, pigment cannot remain vibrant and healthy for long, meaning that your tan will quickly do a disappearing act. Dry skin is also prone to flaking off and peeling as parched cells begin to shrivel. If you want to extend the life of your tan, using Australian Gold Hemp Nation Vanilla Pineapple Moisturizer between your tanning sessions is an ideal solution. This formula was made especially to meet the needs of the skin of frequent tanners’ to preserve coloration and promote good skin health. The base of the formula is the HydraRich blend, which brings together shea butter, jojoba oil and glycerine to add emollients to the tissue while drawing water droplets from the air into the skin, moisturizing it in two ways. With Australian Gold Hemp Nation Vanilla Pineapple Moisturizer, you also get the benefit of pure, THC-free hemp seed oil. This all-natural ingredient is incredibly high in essential fatty acids, which studies show are vital to helping the skin maintain its moisture balance. To lift away dead skin cells and decrease the likelihood of peeling, the moisturizer contains a Vanilla Pineapple Tropical Fruit Blend. The exfoliative actions of the fruit enzymes in this complex combine with vitamins E and B5 to minimize signs of aging and reduce the speed of the aging process. Free of parabens, Vanilla Pineapple Tropical Fruit Blend is a nourishing moisturizer that you can use once or twice per day to keep your tan looking great. Check it out here at TanForLess, where you’ll find the best price. 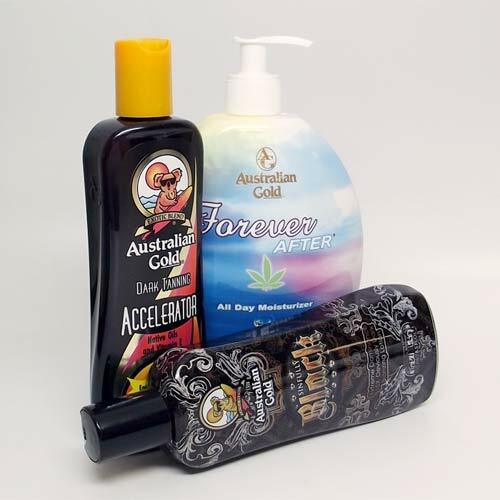 Top selling Australian Gold tanning products all on sale until Monday, Feb. 11. Save an additional 15% now! !